Can you believe it is almost 2014? I am freaking out and trying to figure out where the heck this last year went. If your like me than you are trying to remember all the memorable things that happened so that you can make a flicker movie in your head. This year I have achieved every goal that I set out to accomplish, and much more if we want to be honest. I am a freak when it comes to making lists, mainly because if I don’t write things down I forget. So for me a vision board is AWESOME. The last couple of years I have gotten my girlies involved and we look forward to making our visions come to light. I love to see my teenagers thinking and planning and dreaming about things they want to see happen in the upcoming year. If you are a parent to a teenage girl, you know that these moments of smiles and happy things don’t happen that often. I’LL TAKE IT! So, get your magazines, scissors, kiddos and a good healthy drink and dive in. 1- Keep it simple: Make sure that your goals are not so overwhelming that they tire you out just thinking about them. I promise if you keep them simple, the process will be much more enjoyable. 2- Make sure that your most important goals are at the top of your list. Then if your not able to achieve the not so important goals you won’t be devistated. 3- I separate my goals into 3 different groups and it seems to help me keep everything straight. Health: eating, recipes, weight loss, routines, body parts all fall into this category. Lifestyle: travel, beauty, home, school, cars, money and etc. 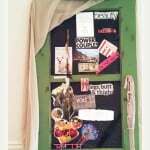 4- I have my vision board in my bedroom and I see it every morning when I get out of bed. 5-My favorite time of day is when I lay down to go to sleep. I run through all of my goals, what I need to get done for my clients, what my kiddos need and of course my dreams. It is so nice to have a second of quiet to hear myself think. To see more from Amie vista her at Dumbbellhousewife.com, follow her on her Facebook page!